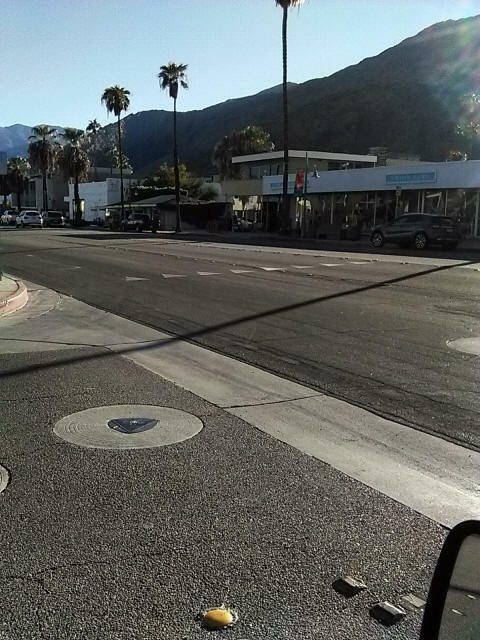 When drivers are facing west on East El Alameda at Palm Canyon Drive they see the following. This is from my Jeep Wrangler about where a car would be turning left. Wranglers are higher up, thus from this height you can see better the middle yellow divider and the triangles look a bit more like a yield sign. From the level of a low car which is what most people drive, they look even more like arrows. An update was made by December 2018 to correct this problem - see image showing the change further down the page. The triangle shapes can be confused with arrows pointing in the direction of traffic flow. I have seen on two Sundays in a row drivers turn left and go directly into this lane which is the wrong way at is for northbound traffic. The triangles are a "yield line" supposed to look like the shape of standard yield signs. These lines are a standard "guideline" which means it's not mandatory by federal standards, but in California which typically goes beyond such guidelines, they made it the rule. 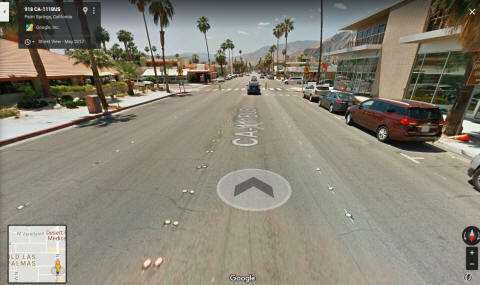 This rule is dangerous as the city of Palm Springs feels it has to adopt it otherwise they would be bothered by the state agencies that would force them to do it this way. It seems the state is unaware of this issue. I have contacted the city and discussed this matter with the assistant traffic engineer there who stated he has only been working there a month or so. We were both looking at a Gooble map as reference and noticed that a few blocks south there is also one of these yield lines which are put before crosswalks to tell drivers where to stop the car and we noticed a long arrow painted either above or below it showing traffic flow. If these are used it should be a rule that there be these flow arrows. That would help, but really I think these lines are ridiculous. They look more like an artsy expression of a line that would be on a gift box. Sure we can learn that they are yield lines but with the chance for confusion that can cause a head on collision they should be banned. I am in the process of assembling my views on this matter to send to the appropriate departments for the state and federal traffic agencies. Here is a view of the intersection with the crosswalk as a driver approaches it facing south. This is just above the central part of Palm Springs hub of activity downtown known as the north end. The yield line on this side can be seen. The left side street is East El Alameda where a driver would wait for traffic to clear to make a left (or right) turn. 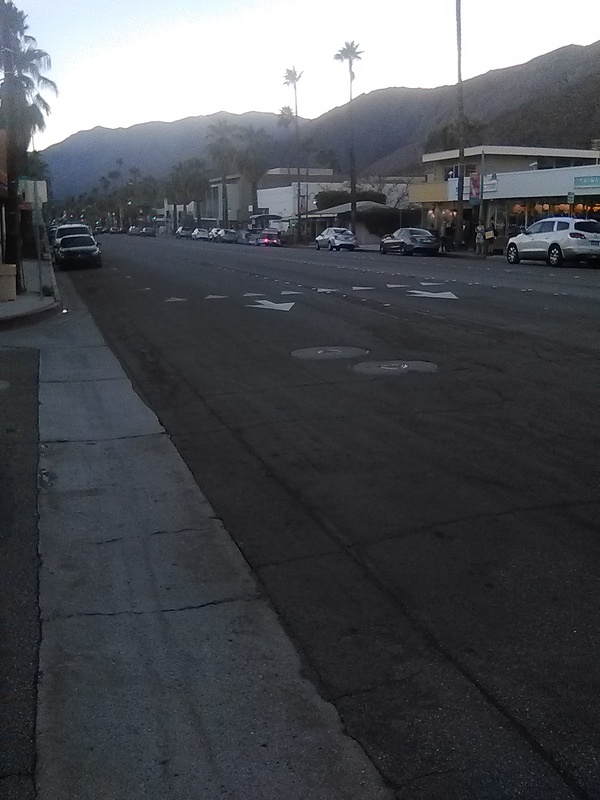 It is difficult for such drivers to see far down Palm Canyon as often there are parked cars. When there are no cars seen immediately (in front of corner florist shop) it driver can tend to look at the road as the going one way when they notice what seems like 8 triangle pointers telling them that is the direction of flow. In the first image above you can see from the drivers point of view that there is no car parked close to that corner that would help them realize traffic flow, they see prominently the 8 triangle pointers. Notice in the above photo for traffic flowing southbound as the car at the crosswalk is heading, that the center double yellow line (actually little line is left only raised yellow buttons) that the line is straight. Here when this intersection had added the special crosswalk signal flashers controlled by pedestrians you can also notice the sidewalks were extended out toward the lanes with handicap ramps. After discussing with the city representative a change was made, here is now it looks now. Directional arrows were added ensuring that the drivers see that those two lanes are flowing northbound. This makes it very clear so there should never be any confusion. A more recent installation at Stevens just south of Vista Chino presents an odd change in design, the traffic now flows (when heading south) in such a way as being diverted into opposing traffic whereas the line shifts to the east then back to the west where it straightens out again. This design shocked me when I first drove on it. I wondered "Oh My God why are they directing traffic into the opposing traffic!!!" Is this another wacky "traffic calming" effect? I have serious reservations about the trend now in place for so called traffic calming measures which in my opinion often can create hazards that did not exist prior. This I believe is one of those hazards. I will add a photo of this later.